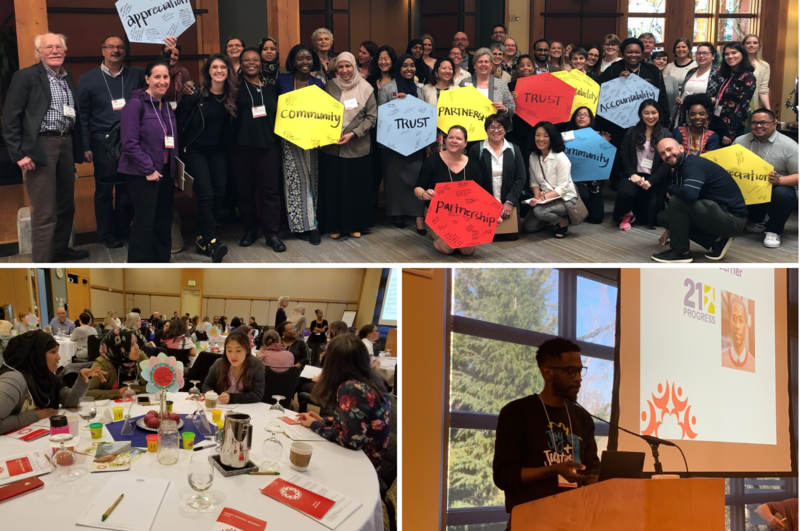 Our 8th annual YDEKC Member Summit last week was an inspirational and energizing day that brought together nearly 70 of our executive leaders to share our stories as non-profit change agents, creating and supporting an ecosystem of supports for young people in King County. We were incredibly excited to have Mozart Guerrier, Executive Director of 21Progress and YDEKC Member, serve as this year’s Summit keynote, encouraging us to share our stories, and to raise one another up! While the Member Summit helped us hone in on a vision for YDEKC’s future, we’re also excited to reflect on the past year and share our 2018 Annual Report! 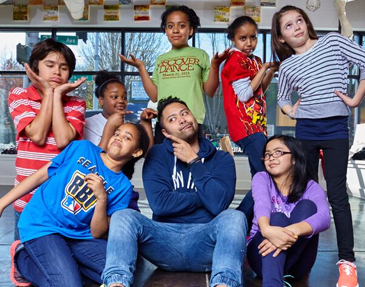 Read on for more ways to get involved, advocate for young people, and improve your practice. We hope to see you soon.Don’t forget! Make sure your programs are updated in the Youth Program Directory, to Like us on Facebook, and to follow us on Twitter to stay up to speed until our next newsletter. YDEKC’s 2018 Annual Report: Our annual report summarizes our advocacy, cross-sector convening, and field building work and shares what we’ve learned and accomplished in 2018. 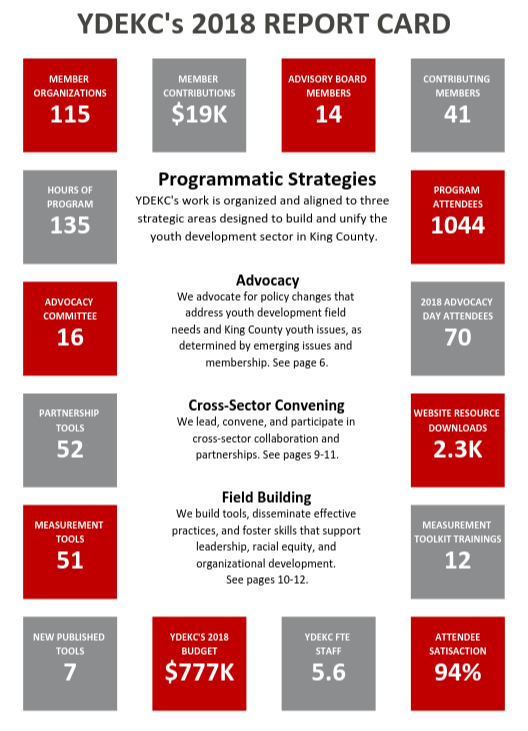 YDEKC’s 2018 Report Card, excerpted from our annual report, is a quick scan of some important and informative numbers about our work in 2018. Click on the Report Card below to view our complete Annual Report. What is Youth Development? : Youth development, or positive youth development, serves as the unifying principle for YDEKC’s diverse coalition of organizations. 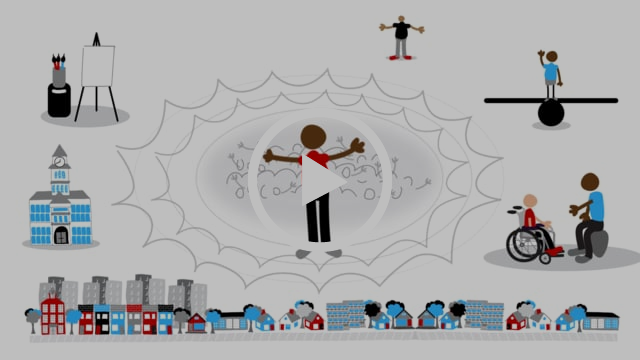 Check out our new video below to learn more about how YDEKC defines youth development. Field Building, Tools and Training Opportunities: We build tools, disseminate effective practices, and foster skills that support leadership, racial equity, and organizational development. Build A Movement! invites you and your colleagues to take action on policy issues that matter to your mission. In its purest form, government is intended to represent the will of the people. This toolkit will support you as you build a movement of people and policy that propels your work to the destination you envision for your organization. “Raising the roof” refers to the tradition of barn-raising—working together to achieve things we can’t do alone. In this session we will define sustainability and identify applicable practices within relationship building, communication, documentation, partnership and program quality, and resource development. Participants will share strategies, assess their own partnerships, and draft a sustainability action plan. All participants welcome, and we especially encourage participation as a school staff/CBO staff pair. Clock Hours offered. Register here. Save the date for YDEKC’s 2019 Road Map Region Whole Child/Social Emotional Learning Symposium! We will be coming together on Friday, August 9th for a day full of cross-sector learning and connection. This year’s symposium will include both system leaders and practitioners with useful content for both audiences. Check out summaries of our last three SEL Symposia here.